On Sunday I attended the annual “Coming of Age” service at the University Unitarian Church, where 9th-graders offer brief statements on how they define faith for themselves. Many were quite insightful. One of my favorite speeches emphasized making the most of today, rather than dwelling on the past or the future. It’s a very familiar message, but one that bears repeating periodically. The UU service came a couple of hours after I made my debut as a Master at the Nordstrom’s Beat The Bridge 8K. Among runners, the word Master has a very specific meaning — 40 years old and beyond — but associated with that are numerous ideas and feelings. For some runners, becoming a Master represents a leveling of the playing field whereby they can let the young kids go and focus on the other Masters. For others, it’s a sort of rebirth — a time to resume serious training and competition after a period of inactivity. As I prepared for Beat The Bridge last week, I exercised what I thought was admirable caution in my speed workouts. I made them shorter than usual and obeyed “speed limits” so that I wouldn’t strain anything. Nevertheless, my left hamstring was bothered by 2x1530m on the mildly uneven surface of Cal Anderson Park’s gravel path and felt slightly gimpy afterward. The race ultimately went fine. With my time of 25:42, I won the Masters division comfortably over David McCulloch (26:46), Travis Adams (27:13), and Mark Donohue (27:51). But the kids left me in the dust. After 1 mile, my hamstring was not quite normal, and I was already out of contention for the Nordstrom’s gift cards given annually to the top 5 finishers. (I placed 3rd in 2006 and 4th in 2009 and 2010.) The winner, 29-year-old Jordan Horn, ran 23:37. Thus, as I embark on life as a Master, I don’t feel like a master in the sense of “master of the universe” or “master of disguise.” I’ve managed to regain some speed on a schedule of running every other day, and I may improve further in the coming months. But my very fastest and healthiest days are almost certainly behind me. As a wise 9th grader once said, I’ll try to make the most of today anyway. 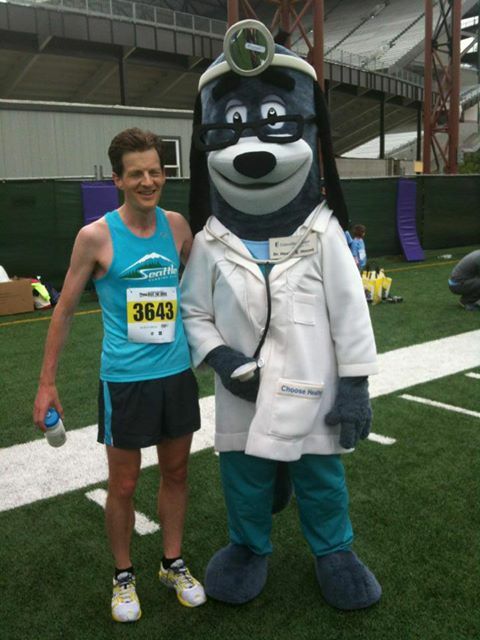 My post-race checkup with Dr. Health E. Hound. It was an extremely deep field this year at BTB. You’ve been making a lot of great progress, so don’t count yourself out yet old man. 🙂 Congrats! My best times in all races above the mile came after I was 40. When I turned 40, I had been in serious training for about 5 years and continued to improve until I was 42 when I suffered a serious bout of mono that seemed to compromise my immune system for about the next 4 years 😦 Anyway, I expect you to get back much closer to your results from a few years ago now that you seem to have conquered your Achilles problem.